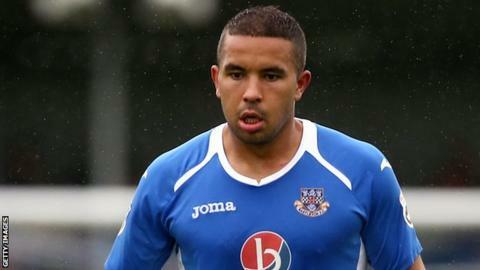 Eastleigh scored two late goals as they came from behind to secure a dramatic victory at lowly Southport. The Sandgrounders looked to be heading for their first win in six league games after John Marsden nudged in Richard Brodie's knock-down from six yards. However, Joe Partington levelled when he nodded in Jai Reason's free-kick. Reason secured all three points for the Spitfires when his deflected effort looped into the net to leave his side three points outside the play-offs. Match ends, Southport 1, Eastleigh 2. Second Half ends, Southport 1, Eastleigh 2. Attempt saved. Harry Pell (Eastleigh) right footed shot from outside the box is saved. James Constable (Eastleigh) wins a free kick. Attempt missed. John Marsden (Southport) header from the centre of the box. Goal! Southport 1, Eastleigh 2. Jai Reason (Eastleigh) right footed shot from outside the box to the top left corner. Richard Brodie (Southport) is shown the yellow card for a bad foul. Goal! Southport 1, Eastleigh 1. Joe Partington (Eastleigh) header from the left side of the six yard box to the top left corner. Assisted by Jai Reason with a cross. Goal! Southport 1, Eastleigh 0. John Marsden (Southport) left footed shot from the left side of the six yard box to the bottom left corner. Assisted by Richard Brodie with a headed pass. Substitution, Eastleigh. Dan Walker replaces Jack Midson. Substitution, Eastleigh. Deon Burton replaces Craig McAllister. Foul by Daniel Spence (Eastleigh). Micah Evans (Southport) wins a free kick. Substitution, Eastleigh. Daniel Spence replaces Paul Reid. Attempt blocked. David Fitzpatrick (Southport) left footed shot from the right side of the box is blocked. Substitution, Southport. John Marsden replaces George Donnelly. Attempt missed. Jai Reason (Eastleigh) left footed shot from the left side of the box misses to the right. Substitution, Southport. Micah Evans replaces Will Beesley. Attempt blocked. Craig McAllister (Eastleigh) right footed shot from outside the box is blocked. Attempt blocked. Jack Midson (Eastleigh) right footed shot from outside the box is blocked. Attempt blocked. Craig McAllister (Eastleigh) right footed shot from the right side of the box is blocked.